We all have our favorite levels and places in games. But do you ever think about the artistic choices that make you feel certain ways about them? A few weeks ago I was talking about how the architecture and atmospheres in Zelda temples can contribute to our psychological experiences in the game. 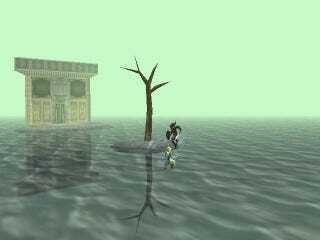 For example, the Spirit Temple and the Water Temple both (to me, of course) use loneliness to great effect. They're different types of loneliness, though. The Spirit temple uses large spaces and emptiness to imbue a sense of wonderment. You're small in the face of something ancient and mysterious. It's not a negative type of isolation. The Water temple, however, is the internal, anxious type of loneliness. There aren't really airy spaces. You're always aware of being enclosed in this place. Brilliantly, the first time you do get into an open space, you must literally fight yourself. Pretty cool to think about! Is there anything in games that you like to analyze or "over-think?" What about the design of your favorite places made them your favorite? Talk about this or everything else below.